1. Peel and devein the shrimp, rinse, then set in a bowl. Coat well with the Jamaican Jerk Blacken. 2. Heat a fry pan to medium / high, add the butter and oil, then enough shrimp to barely cover the pan. Don't put more than one layer in at a time, because they won't cook evenly. 3. Turn the shrimp after about 2 minutes, and continue to cook for another minute. If you cook them too long, they'll come out real tough. 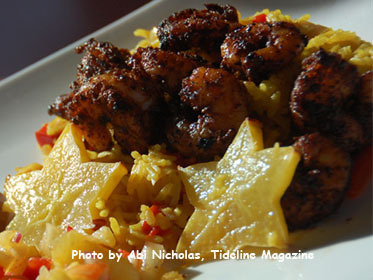 Place the shrimp on a bed of Coconut / Citrus Rice and drizzle with fresh lime juice, or Jerked Citrus Sauce.